The Nextiva App is a great resource for business users to manage their unified communications solution. It has never been easier to use voice, video, instant messaging, and Team Presence services from a single device. Users can access account and feature settings from their computer, tablet, or any mobile device. The app is supported in Windows, macOS, iOS, and Android platforms. The Nextiva App enables a new level of flexibility and productivity that truly changes the way businesses operate. No longer tied to a control panel interface, or required to have system administrators make changes, users can instantly update their communications service from anywhere. 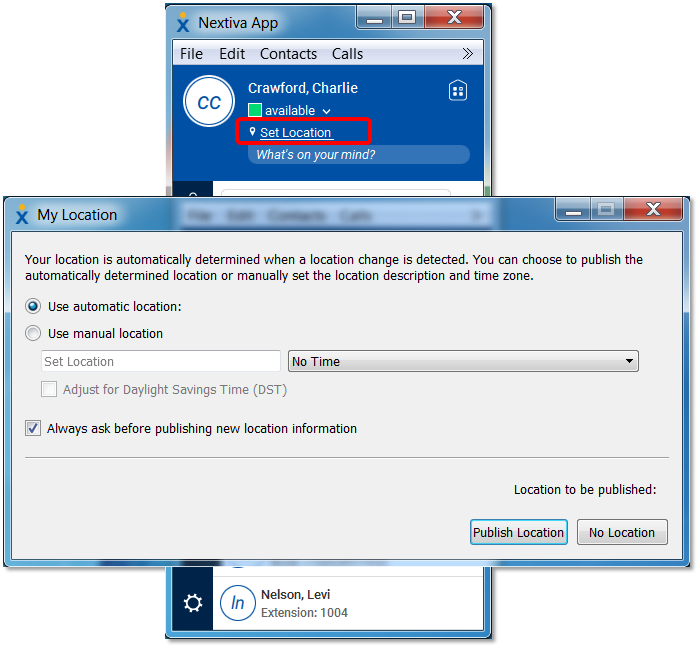 NOTE: As a prerequisite, an Office Pro Plus or Office Enterprise license is required to use the Nextiva App. For assistance assigning a license to a user click here. How do I Download the Nextiva App? Android 4.4 and newer and Apple iOS 10.3 and newer are required. 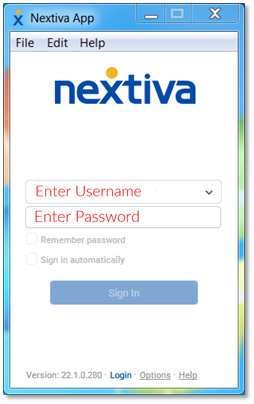 You can log into the Nextiva App using your user-level log in details (Figure 1-1). NOTE: For desktop versions of the App, you may have to add “@nextiva.com” after your username (i.e. username jsmith becomes jsmith@nextiva.com). Also, usernames are case sensitive. Team Presence allows you to let other Nextiva App Users know what your status is. In the same way that instant messaging services allow you to share that you are Available, Away, or Busy, you decide what your status is. You can adjust your availability settings, or easily check the status of a contact via the Nextiva App, to determine the best way to contact them. To add someone to your contact list so you can see his or her Team Presence, select the globe icon from the menu bar on the left. This is your Directory (Figure 2-2). Here you can search for anyone in any group within your Nextiva account. On a mobile device, you can search your mobile contacts as well. NOTE: You will not be able to see Team Presence if they are not a Nextiva user with a phone. Right-click on a person’s name and select New Contact to share presence with them. You can also select View Profile to see key contact details (Figure 2-3). Once you request to view someone’s team presence, and they accept the invitation, you will see their full contact info and presence appear on your Contacts List. Set your location settings or hide them, the choice is yours. Here, you can also type in a personal message, or any other details you would like to share with your team (Figure 2-4). NOTE: You can also change or clear your photo by right-clicking the photo (if present) or initials in the upper left corner of the status bar. Chat with one teammate at a time, or as many as you would like. You can double-click on the User’s name to open a private chat. 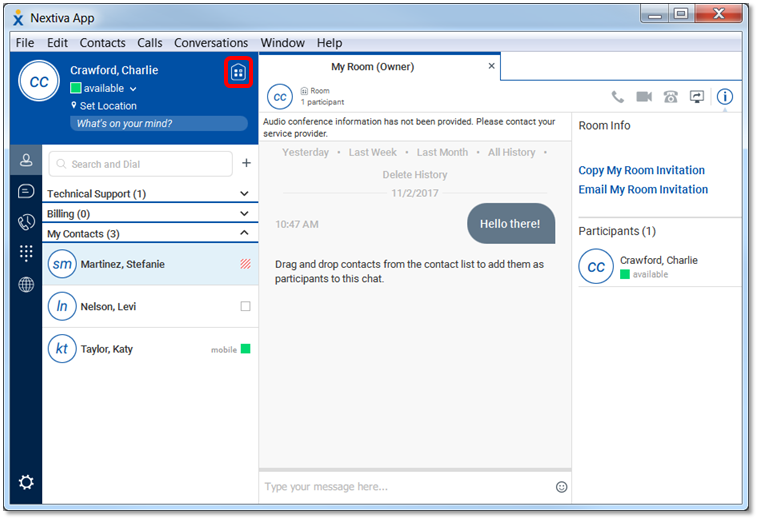 Select the My Room option at the top of the Status Bar to open a Group Chat Room, which will allow you to drag-and-drop participants into a discussion (Figure 2-5). You can also email or copy the invitation and invite a contact to join your room. NOTE: When opening a My Room invitation, Firefox is no longer a supported browser. The latest version of Chrome, Internet Explorer 11+ (Windows), and Safari 7+ (Mac) are the only supported browsers. If you are chatting with an individual and want to add a new participant, click their name from your Contact List and drag-and-drop into your existing chat window. 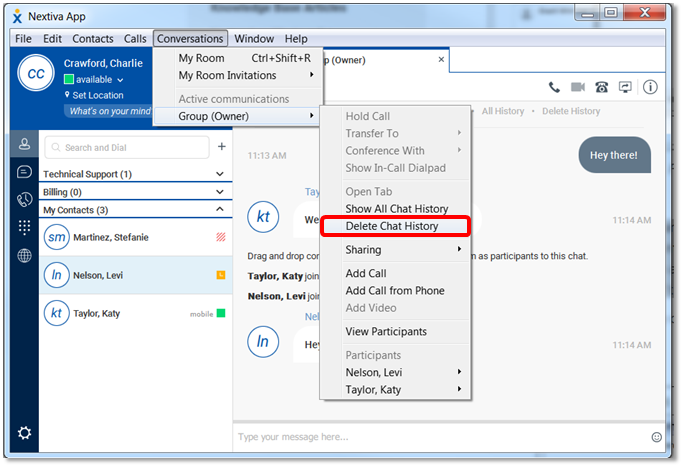 The chat window will also show chat history, whether you are in a group chat, or individual chat. You can delete chat history under Conversations > Group at the top of the App window (Figure 2-6). 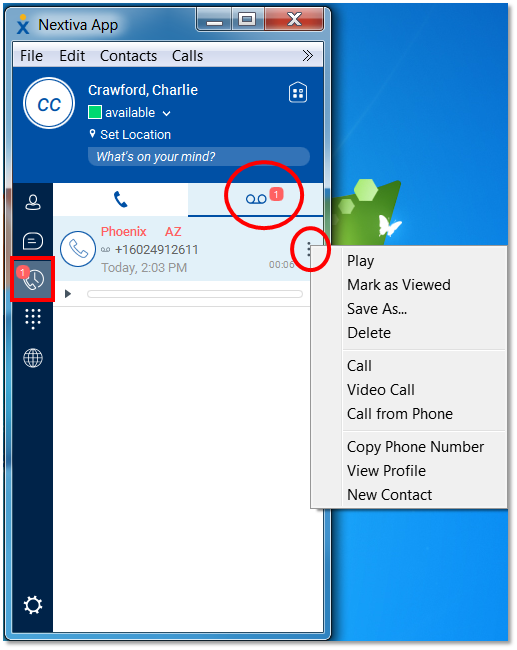 Also within a chat window, click any of the phone or video icons at the top to call or video call the person with whom you are chatting (Figure 2-7). 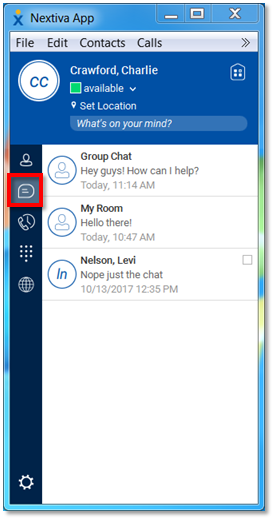 The first Join Room button on the left creates a Group Chat room. The phone handset calls the User through the App directly. The video camera is used to video call people in your Enterprise, and other Nextiva Users. The retro handset sends a call directly to your desk phone. The display screen allows you to screen share via the chat window using the share icon. The information icon opens the information panel to show the User’s contact information. NOTE: You can file share within individual chat scenarios by dragging a file into the chat window and dropping it, or clicking the file share icon. Note that this will not work if the end recipient is on a mobile device. Screenshare collaborate with other Nextiva Users, or anyone you send a custom link to, via the App chat window (either individually or in a group chat). 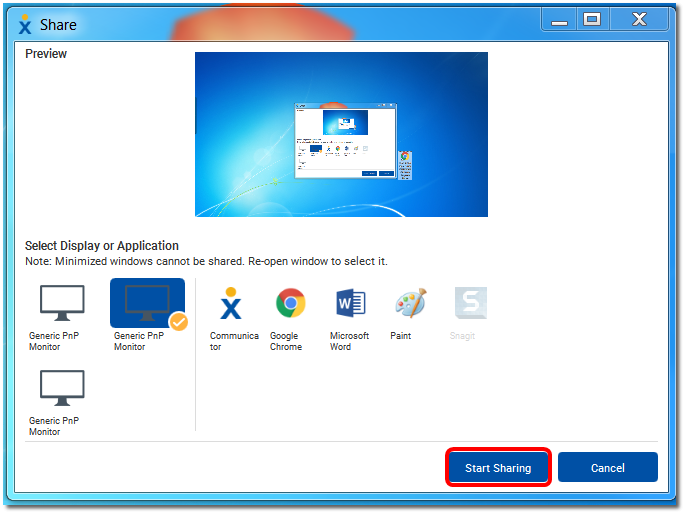 You can share your entire screen, just a specific program, or a browser window. 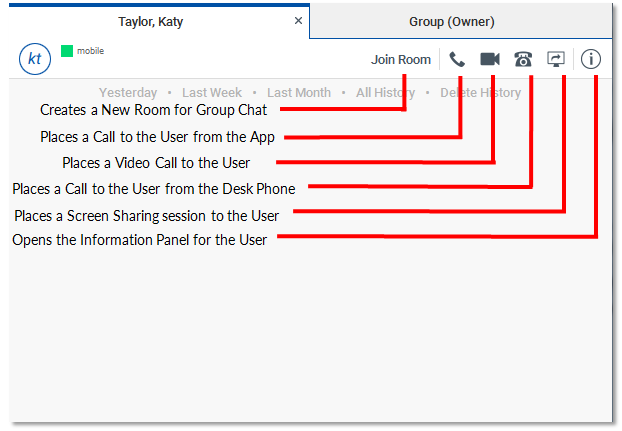 To start a Screenshare, open an individual or group chat room and click the share icon (Figure 2-8). To share just one program or window, click on the program icon displayed in the center of the window. Click Start Sharing to begin. All participants in your chat room will also see the Screenshare (Figure 2-9). Make and receive calls from all devices, physical phones and the App, and show the same caller ID as your business line (Figure 2-10). 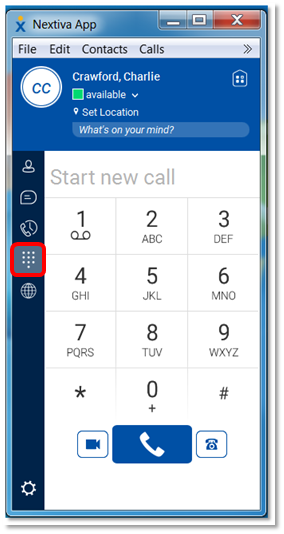 NOTE: You can move calls between each of your devices, seamlessly, using the star code *11, or select Calls > Pull Call (or CTRL + P) from the App. If you are on a call on the App, dial *11 on your physical phone to pull the call to the new device. Your caller will not notice the transfer, and will not hear hold music during the move. You can pull calls multiple times during a call without any trouble. 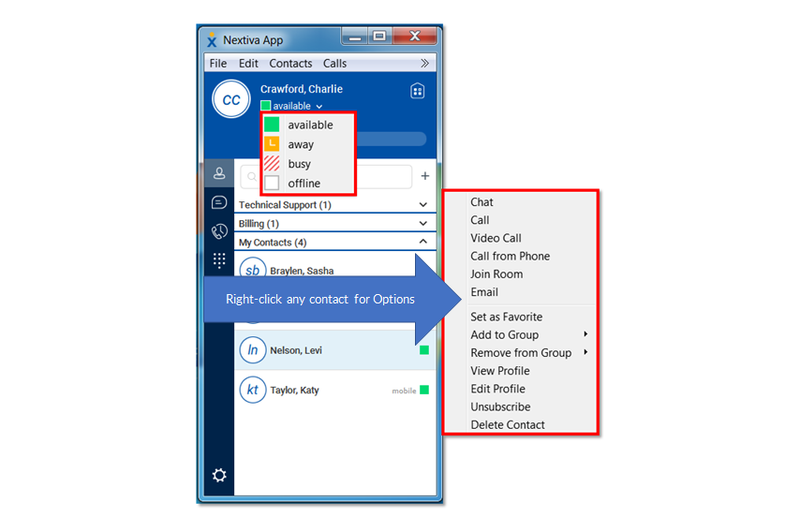 You can also see your call history, whether you made the call from your App or physical phone, using the Nextiva App (Figure 2-11). You can also see your chat history using the Nextiva App (Figure 2-12). You can also listen to any voicemails left in your NextOS Voice Portal by going into Call History, selecting the voicemail icon in the upper right corner, and selecting any of the available options after selecting the ellipses (Figure 2-13). Under the options for each voicemail (right-click the ellipses shown above to reveal), you will see options for play back, deletion and much more. You can also click New Contact to add the caller to Contacts, or dial the number through this section in the App. If someone at your Enterprise leaves you a message, you will have options to view their profile, email, or chat with them as well. 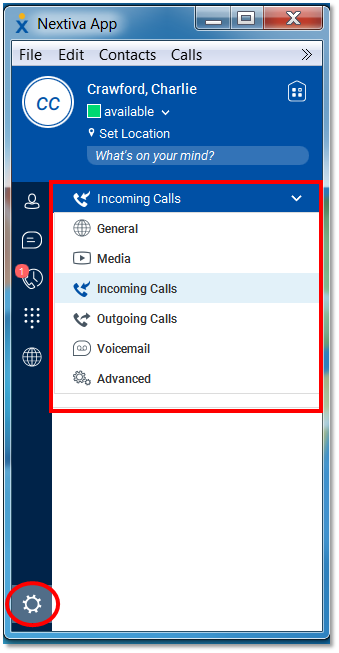 Under the Options section (Figure 2-14), you will find settings for voicemail, Call Center status, Highlight to Call, and many more popular features and options. To access the Options section, click the cog icon in the bottom left corner, then choose from the drop-down menu at the top (Figure 2-14). To view all other Call Options and Preferences, click here. To contact our support team please email us at support@nextiva.com. You can also Submit a Ticket, or give us call at 800.285.7995.